For all-round use , with a slim design that enables access in confined areas. Comfort grip at the front. Alternative 90 degree blade mounting for flush cutting. Comes with 4 shatterproof bi-metal blades. 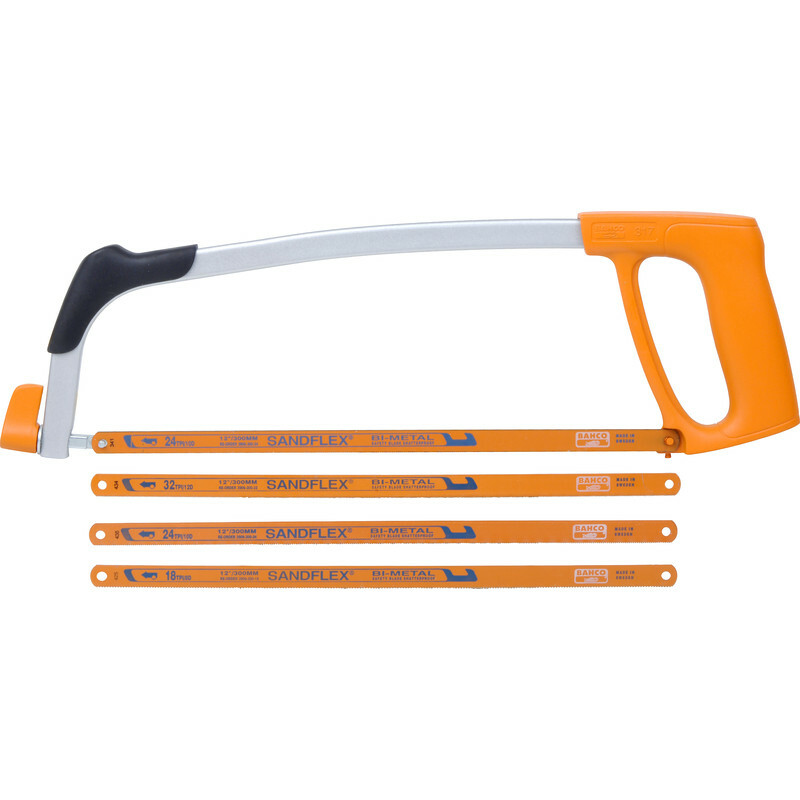 Bahco 317 Hacksaw 12" is rated 5.0 out of 5 by 9. Rated 5 out of 5 by Antwillall from Great quality hacksaw with 4 free blades Bought it for a small job but thought I would get something of decent quality and fit the price to include 4 different blades it made perfect sense. You can’t go wrong. Rated 5 out of 5 by Skii from A better hacksaw. This is a well made saw with decent blades, easy and comfortable to hold. This is so far the beat hacksaw I've bought in forty years. Recommended. Rated 5 out of 5 by Cpcleading from Quality at a decent orice This is a solid well designed addition to the toolbox. Forget the cheaper varieties this one is built to give you a quality cut (mix ofextra blades included) and to last. Rated 5 out of 5 by Gfree from Great Holds the blade well. Good for its price. Rated 5 out of 5 by Thomasthetom from Very tough blades and handle The blades are very durable and the frame does not flex at all. Rated 5 out of 5 by Data Rick from The BEST Hacksaw on the market! I have tried a few hacksaw's in the past but this is the best one I have used. It's that good I have brought a second one as someone on site thought it was also fantastic and nicked it! Highly recommend it! Used it for cutting dado PVC trunking and unistrut with easy! Rated 5 out of 5 by eastangler from Easy to use Bought this to replace eclipse one that I misplaced, now glad I did.